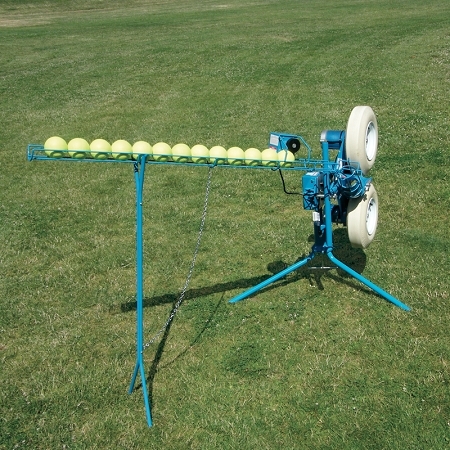 This JUGS 14 Ball Automatic Softball Feeder is made specifically to fit select JUGS softball pitching machines. 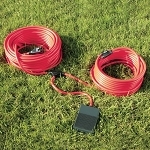 It will fit Jugs softball or combination softball/baseball pitching machines only. Please select the model of your pitching machine when ordering so that you get the model that is designed to specifically fit your pitching machine. It holds up to 14 real or dimple 12" softballs and feeds them intermittently into the pitching machine, releasing a ball approximately every 6 seconds. This allows hitter to practice solo, without needing someone to feed a ball into the pitching machine one at a time. For even greater control, consider purchasing a JUGS In-Line On/Off Feeder Remote Switch. Made of durable lightweight steel, the JUGS 14 ball softball feeder is built to last. Keep in mind that pitching machines and auto feeders can be damaged by direct hits from batted softballs. You should always protect your equipment with a protective screen. Please visit our Softball Screens page to see the available protective screens for pitching machines. IMPORTANT: The JUGS 14 Ball Softball Feeder is only designed to work with 12 inch softballs! No matter where you order a JUGS 14 Ball Softball Feeder from, NOBODY actually stocks them; they all ship directly from the manufacturer's warehouse located in Tualatin, Oregon. Therefore, the shipping time frame is exactly the same no matter what website you order from (we hope that it is this one! ).